When we arrived in Arizona, the first leg of our 2017 River Ramble adventure, we were excited about more than just fishing. As a matter of fact, we spent the early part of our time in Arizona hiking, enjoying the outdoors, meeting up with old friends, hanging out with our daughter Kelly and yes, we still did manage to find a river to fish before our first “official” TU Top 100 river of 2017. We set up camp at the Lake Pleasant Recreation Area in North Peoria, AZ, a burb of Phoenix. We took some time to hike around the area trails, stumbling upon some burros grazing on the side of the hill. Beautiful cactus of so many different types were everywhere. We also found some beautiful wildflowers already blooming along the trails. 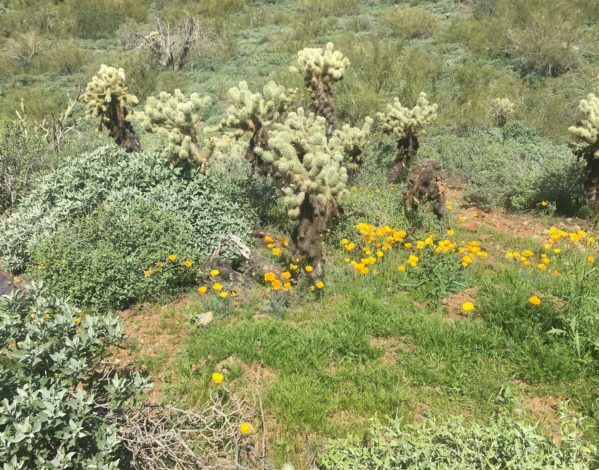 We especially enjoyed the yellow poppies that seemed to be the first up in the desert landscape. We did find a river to fish just north out of Sedona called Oak Creek. 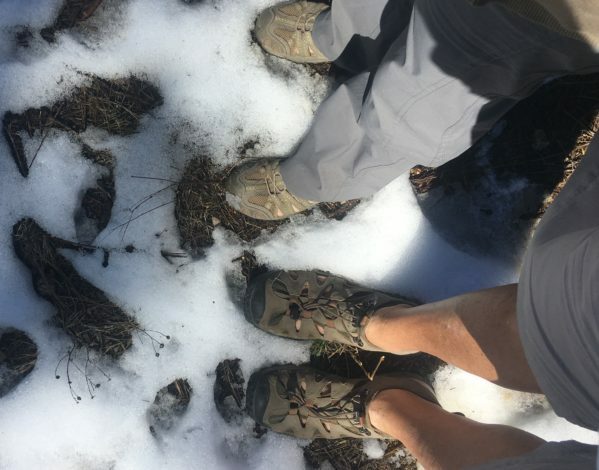 When we contacted some of the local guides about fishing the river, we learned that the river was blown out by melting snow from the mountains around Flagstaff. Such news might discourage others, but Barb and I still ventured up Oak Creek Canyon to see the river and wet a line. It looked like a green veggie smoothie flowing downstream. While the fishing wasn’t great, the scenery was. The drive up and down the canyon was spectacular. When we got back to Phoenix, Kelly was off work and we were able to go to a farmer’s market and a street fair. Later on, we attended an Arizona Rattlers Indoor Football League game as well as a Suns game. The fans in Phoenix are very lout and proud of the home team. We had a blast with Kelly, exploring Phoenix and just hanging out. Some of our dear friends from Lincoln NE, Ted and Deborah Watson, came to Phoenix to visit their daughter and we had a chance to catch up with them as well. Its always so much fun to see them. We had the pleasure of going to their daughter, Katherine and her husband Brian’s home for burgers and beers. Then after they’d hit the links, we met up for BBQ in Cave Creek. We’re already planning a meet up in South Dakota as we traverse the US from west to east in August. Next, Chuck and Marty Raplinger invited us to join them and their Benedictine College Raven college buddies for a weekend of baseball, BBQ’s and pickleball. Terry and Sandy Cullen were the ringleaders of our pickleball matches and helped us learn how to play the game. As you can see in the pictures, everyone had a lot of fun in the sun and at the ball game. While I whiffed at my share of pickleball shots, I’m already looking forward to seeing everyone next year if they’ll have us back. By then, maybe the muscles I’d not used in forever will be recovered and ready to play more pickleball. Finally, we were joined by a couple of fishing buddies, James Kelley and Dan McCormack, as well as James’ son Andy to fish the Colorado River, Lees Ferry Reach. Before we fished however, we attended a game at Sloan Park between the last two World Series champs, the Royals and Cubs. The Royals came out victorious, but, it’s just spring training. Hopefully, this will carry over into the regular season. Who knows, maybe they could meet in the 2017 Series. Once we got to Lees Ferry, it was fish on! We went out on the river with Skip Dixon and Kevin Campbell of Lees Ferry Anglers. We motored upstream from the Lees Ferry put in, where the Grand Canyon raft trips begin. We were in search of beautiful rainbow trout, not rapids. We found them in some of the most beautiful areas we’ve fished. And yes, while it’s really not about the fish, we DID catch some beautiful ones. We also had a chance to tour some of the cave dwellers ruins, more wildflowers and a picturesque view of Horseshoe Bend before the sun set on our Arizona adventure…. giving us memories that will be with us forever. When we were planning our trip to fish the Lees Ferry Reach of the Colorado River, we contacted Lees Ferry Anglers in Marble Canyon, AZ. We were excited to fish with them because the owners of Lees Ferry Anglers are Terry and Wendy Gunn, who have written several fishing guide books that are must reads. While we are currently fishing our way through the Trout Unlimited Top 100 list, Terry and Wendy have written books on the 50 Best Tailwaters to Fish and one I’m sure we’ll be fishing our way through, 25 Best National Parks to Fly Fish. Our Lees Ferry Anglers guides for the trip were Skip Dixon and Kevin Campbell. I say guides because we were joined by Dan McCormack, James Kelly and son, Andy. It must have been a tough decision for Skip and Andy to determine who got Barb and me and who got the “guys”. It ended up, Barb and I went out with Skip and the guys went with Kevin. We put in at the Lees Ferry put in site, which is also the put in for rafters going down through the Grand Canyon. The Grand Canyon trips are 14 days on the river, packing in everything you need for sleeping on the banks of the river and shooting some Class 8-10 rapids (many western rivers use a 10 point scale vs. the usual class I-V scale). Needless to say, we headed UPSTREAM in jet boats to fish the sections from Glen Canyon Dam down to the Lees Ferry put in. While we went upstream in boats, we actually wade fished on the trip. We’d scurry from spot to spot, fishing for a few hours at each spot along the river. We were fortunate to hook into some really nice rainbow trout along the way with the guidance of Skip and Kevin. Our guides also pointed out some canyon features and wildlife along the way. We saw wild mustangs, osprey (they love to fish more than we do!) and even 6 condors riding the wind currents above the canyon walls. The guys saw Peregrine falcons soaring the red cliffs of the canyon. We always, always say “Its Not About the Fish”, and in this case, while the fishing was great, the scenery was even better. We fished at the curve of Horseshoe Bend, but the view from above was spectacular, if not a bit scary. You walk out to take the iconic picture of the area, and there are no handrails, fences or other barriers between you and a huge drop into the canyon. I couldn’t get Barb to go near and she hid her eyes watching others peering over the edge. Everyplace we’ve fished thus far has been beautiful. The saying, “trout don’t live in ugly places” is so very true. However, we’d have to say that of all the rivers we’ve fished, this is one of the most spectacularly scenic places yet. That said, we’ve now fished 48 of the TU Top 100 Trout Streams so there are 52 more to go! We hope you enjoy this “Guide Talk” with Skip and Kevin. It’s incredibly informative and these guys obviously love this river and having fun along the way. If you come to the area, make sure to contact Lees Ferry Anglers and ask for Skip and Kevin!!! We arrived in the Phoenix area after enduring the drive across west Texas and a snippet of southern New Mexico. It’s actually a beautiful drive with the southwestern mountains framing the desert landscape. Sunsets were incredible each night. 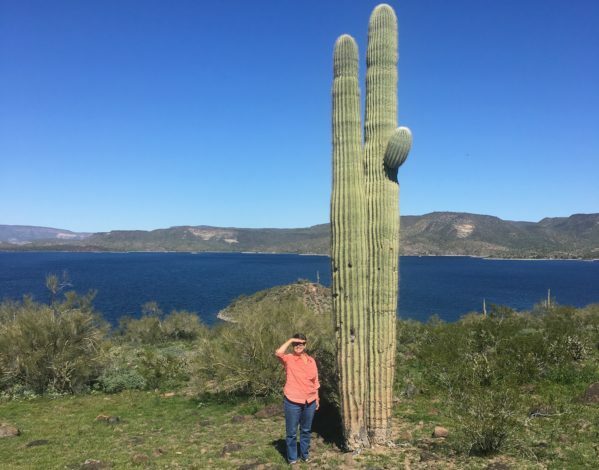 When we first arrived we were at Lake Pleasant Recreation Area where Barb was dwarfed by a giant cactus. But now, the SaraLinda is parked in the Cave Creek Recreation Area north of Phoenix. We’ve been having a blast hanging out with our youngest daughter Kelly, taking hikes, going to a few Phoenix sporting events (Suns and Rattlers) and sampling some of the Phoenix cuisine. We’ve also met up with our dear friends from Nebraska, Ted and Deborah Watson along with their daughter Katherine and her husband Brian. We had such fun catching up, eating BBQ and hanging out. Hiking has definitely been a major theme of our time so far in Arizona. We’ve hiked 6 trails so far and they’ve all had their unique character. 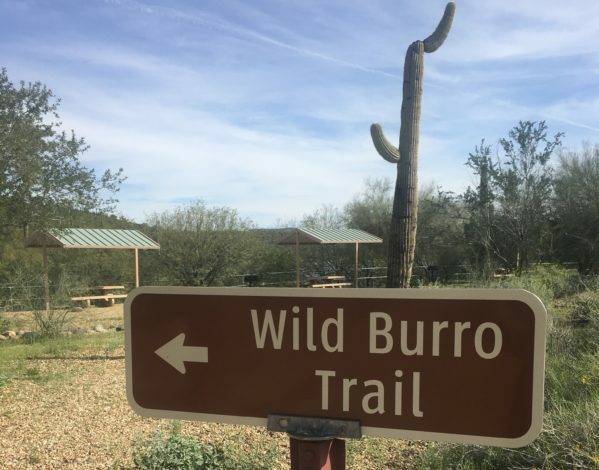 Our first hike was on Wild Burro trail as we were hoping to find… ummmm… wild burros. Our hike was along the lake and beautiful wildflowers were popping up, especially the yellow poppies. The big “bloom” is about to happen here and it will be spectacular. We’re hoping to still be here when it happens. We saw so many plants almost ready to pop open. As we left the Wild Burro trail and headed back to our campground, of course, what did Barb see on the side of a hill, THE BURROS! We stopped, I hiked down the hillside and then along the Beardsley trail toward them to get a picture. The three in the picture above were giving me the eye so I didn’t venture any closer. 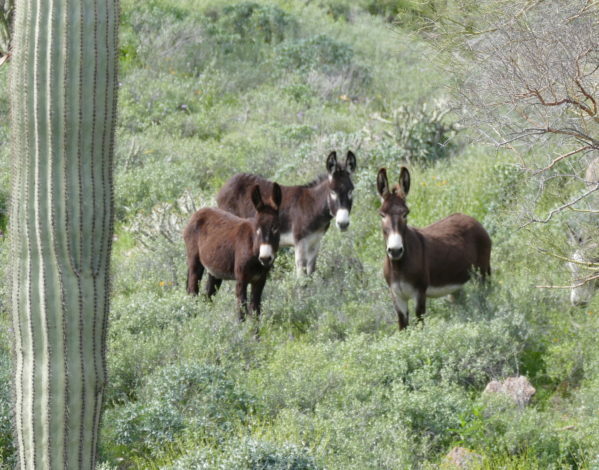 There were at least 16 burros in the group just lazing along, snacking on the plants along the hillside. While our first Trout Unlimited Top 100 Trout Stream fishing won’t happen until next week, we did find a trout stream about 1.5 hours North near Sedona. Oak Creek is a small stream flowing through the Oak Creek Canyon south through Sedona and ultimately joining the Verde River. The drive from Sedona to Flagstaff which parallels Oak Creek is recognized as one of the Top 5 Most Scenic Drives in America according to Rand McNally. We had a great drive up to the scenic lookout above the canyon and of course, there was snow…. yes snow in Arizona. While we drove up to the scenic lookout, we were spying for good pullouts so we could fish our way back down to Sedona. We ended up stopping at three different spots, but the river was blown out from rain and snow melt in the Flagstaff area. While river conditions made it impossible to wade safely into the water, we still decided to at least wet our lines from the bank. No fish were caught but we had a great time practicing short casts and high sticking in the narrow, tree lined spots we’d picked. We finally made it back to Sedona, took a few pictures of the beautiful surroundings there, and headed back to our campsite. We are excited this week to see a host of friends from our original hometown of Lexington, MO who are coming in for spring training games. We’ve got more BBQ’s, ball games, hikes and even pickle ball, whatever that is. And, we have some fly fishing buddies coming in on Sunday who’ll be with us to kick off our “official” start to year 2 of our River Ramble. Until next week, its time to….